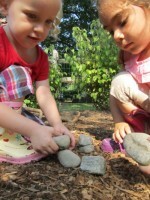 The Early Childhood outdoor classroom and nature playground at Abington Friends School was built as part of AFS Outside, a school wide outdoor learning program designed to powerfully connect children in sustained and meaningful ways. AFS Outside connects students with the living world while fully realizing the enormous potential of our beautiful 50-acre campus. The collaborative planning process for the space included our faculty and staff, our students, our families and our administration, along with the Arbor Day Foundation, community organizations and our team of architects. Our Lower School students also participated by contributing their ideas and engaging in lively discussion as the project unfolded. 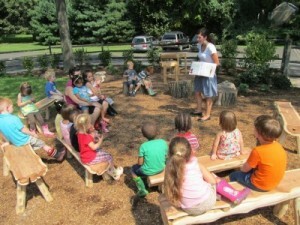 The nature playground opened to our youngest students at the beginning of the 2012 school year. Our new site serves as both playground and classroom, creating a vital space for outdoor activities in all weather and offering the varied experiences of exploration and imaginative play that are such critical development experiences for young children. 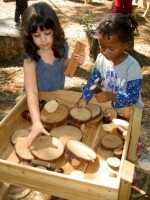 Strolling through this welcoming series of activity areas made from wood, stone and plants you may come across a group of excited kindergarteners using tree cookies or branches as building materials. From the music and movement area drifts the sounds of children investigating the music they can make with a large marimba and other instruments made from natural materials. 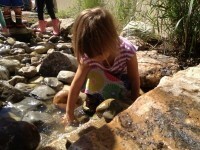 Nature’s scents, sights and textures are all around as the children dig in the dirt, climb on logs, make mosaics from seedpods, collect pebbles and splash in the water. 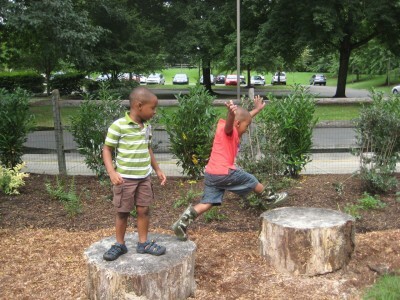 The playground includes platforms for creating imaginative settings such as tree forts; areas for building with all sorts of natural materials, spaces for making art and music; and plenty of open areas for running, climbing and playing games. What was once a traditional playground has been transformed into an inviting outdoor space that encourages learning, discovery and play in a beautiful, natural setting. 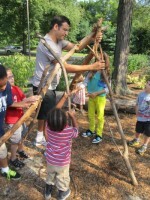 Metcalfe Architecture and Design, a Philadelphia firm, designed the final element in the nature playground and outdoor classroom, a much-anticipated outdoor play structure. Evocative of sailboats and castles, and much, much more in the imagination of a 3 or 4-year-old, the play structure was an instant hit, with children peeking out from the slatted wooden walls, skipping down the ramps, digging in the wood chips and devising all manner of games and imaginative play. In addition to Metcalfe Architecture and Design, we are also deeply grateful to Valley Crest Landscape Services, Primex Garden Center, Briarbush Nature Center and several generous donors from the AFS community without whom we could not have realized this ambitious vision. We also thank the Pennsylvania Department of Environmental Resources, who awarded the School a grant in support of AFS Outside.